I have learned …. Following new leads in the quest for further facts may sometimes lead down new and intriguing pathways, not always to the expected destinations. And on the way, it’s not wise to push seemingly irrelevant information to the wayside. One day, suddenly, it may all fit in. My great great uncle Robert Wentworth Wade was the Mayor of Hokitika between 1892 and 1894 and a councillor for several years on either side of those dates. I knew he had married an Irishwoman, Kate Behan, although it was some years before I found the actual record of their marriage. Having a reasonable amount of information about Robert, I decided to investigate Kate a little further. I “knew” when she arrived in Hokitika as I’d seen the shipping record – Miss Behan aged 19, in the saloon of the ‘Otago’ from Melbourne, in 1868. Kate then disappeared from public records until 1893 when she reappeared on the suffragettes’ roll and also on the electoral roll as a property owner. What happened to her in between? I checked the original passenger list and noticed there was another young Irish girl and a gentleman of about 35 in the saloon of the ‘Otago’, and they were the only other saloon passengers who disembarked at Hokitika. Why would two apparently wealthy, unaccompanied young women go to a wild rough frontier town? Having recently read a fictious novel of life on the west coast of NZ’s south island, it was easy to romanticise that Kate and her companion were probably high class young ladies brought over from Melbourne by the gentleman to work in an exclusive saloon where the miners would soon be divested of their gold. Also that Kate must have managed to remain sufficiently respectable to marry the Mayor! Once I saw their marriage certificate, the picture changed. Kate or rather Catherine was styled a ‘Lady’ with a suspiciously great flourish – and her age was given as 36. If she was 19 in 1868 then she would have been about 45 in 1894 – did she exercise a Lady’s privilege to take a few years off? 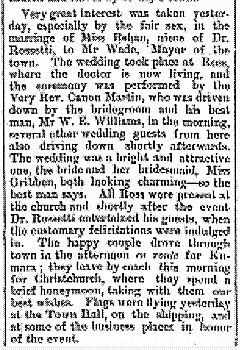 With the known marriage date it was easy to search the West Coast News around September 17th 1894, and I soon discovered an account of the wedding and realised my romantic notions had led me astray. Miss Behan was the highly respectable niece of one of the town’s leading doctors, Dr. Rossetti. 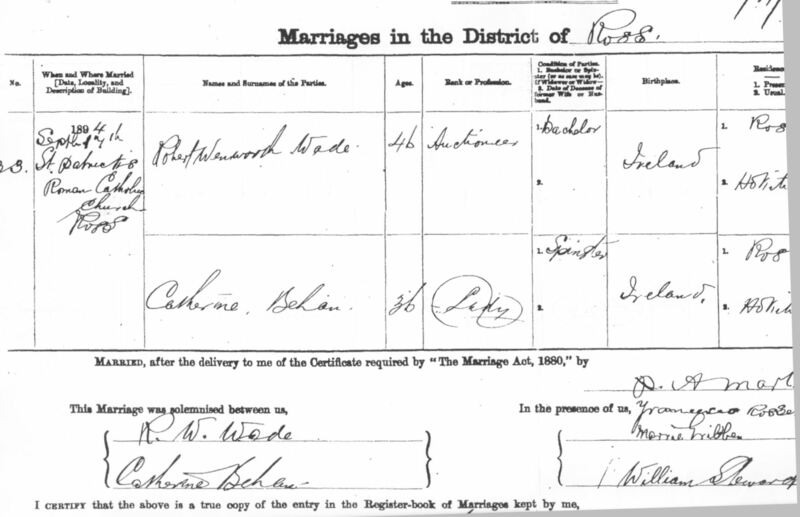 The marriage certificate told me that Catherine (Kate) Behan was born in Ireland to Peter Behan, a farmer, and Bridget O’Grady. Knowing the difficulty of searching Irish records, I wondered if Dr. Rossetti could lead me to discover more about Kate’s origins. The surname Rossetti was not listed as a surname of interest in the NZSG so I asked on the NZ Rootsweb list and was immediately sent information from a private database of early NZ doctors. Dr. Francesco Rossetti was born in Switzerland and graduated as a MD from Pisa, Italy in 1850. He emigrated to Australia and was practising as a doctor in Hepburn, Vic in 1865. He was deleted from the Victorian register in 1866 and registered as a doctor in Hokitika in the same year on 22 June, and registered again under a later Act in 1868. He was naturalised in NZ on 21 January 1870, appointed the Italian consular agent in Hokitika 31 March 1870, and the public vaccinator for Ross (close to Hokitika) in 1897. He died in Hokitika on 11 July 1904 ‘aged 73’ (actually 79, from his gravestone, therefore born about 1835.). His will was in Christchurch and the NZSG Cemetery fiche listed him and his wife Catherine who died in 1889 aged 66. All easily verifiable facts. I had high hopes of obtaining more information from Dr Rossetti’s will but it was a disappointment. He left his entire estate to 4 nieces, three in Ticini, Switzerland and one in Paraguay. Mention of Dr Rossetti practising briefly in Hepburn, Victoria sent me off on another path in the quest for information about Kate. I searched the Victorian BMD records for a Rossetti-Behan marriage without luck, and then started to look further afield. It did not take long to find Rossetti-Maher and Maher-Behan marriages, although not in the same generation, and the exact link remained obscure. Guiseppe Rossetti, born in Switzerland, married Ellen Maher and they lived in Hepburn. Was he Dr. Francesco’s brother or cousin? The Victorian BMD records also showed that a Bridget Behan, born in Ireland, married David McDonald in 1874, had six children, and died in Melbourne in 1914 aged 64. Her parents were Peter Behan and Bridget O’Grady, making her Kate’s elder sister. Bridget would have been born about 1849-50 which would make her 19 in 1868, the age of the young lady who arrived in Hokitika on the ‘Otago’ that year. Then I discovered a younger Miss Behan aged 16 who arrived in Hokitika in 1875, also in the saloon of the ‘Otago’ – Kate! 1875 was the year after Bridget was married, time for the young Kate to leave the protection of her sister and visit her uncle. I also found Kate’s death in 1949 in Melbourne, a widow aged 94. I knew that her husband Robert had died in 1903 in South Africa and that Kate accompanied him there, but did not stay. So, I felt I had sorted out the Behan sisters satisfactorily, if not their relationship to Dr. Rossetti and his NZ wife, another Catherine. Kate led a long life doubtless surrounded by her sister’s family. I joined the Rootsweb-Vic genealogical discussion list and that was when complications arose. I was sent an entry from a book by Joseph Gentilli about the early Ticinese immigrants to Australia – a story in itself. 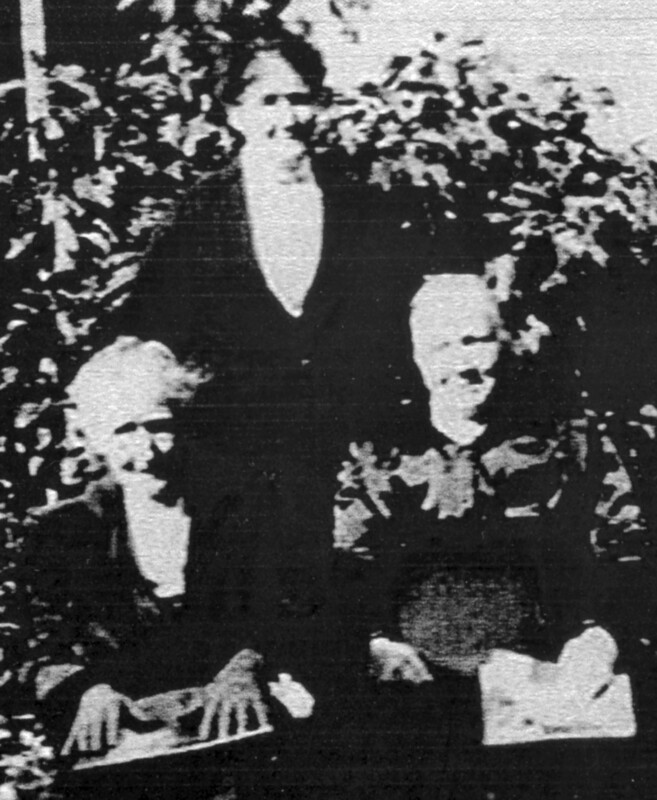 It listed seven Rossettis all from Biasca, Ticini including Guiseppe who married Ellen Maher; and – to my surprise – a Dr. Francesco Celeste Rossetti who had married Honora Quinn and had 5 children in the Hepburn-Queenscliff area between 1868 and 1878. It further said that Dr. Rossetti was born in Biasca in 1835, emigrated to Australia on the ‘Chusan’ in 1853, was a hotel and storekeeper in 1855; naturalised in Australia in 1861, a Hon. Surgeon at Daylesford hospital, at Hokitika NZ in 1885 (? ), and owned a restaurant in Geelong, Victoria in 1891. It did not list his death. Was this actually the same man? Checking Victorian shipping turned up an entry for an adult male Rosetto, no other details, who arrived on the Chusan in 1853. This must have been the entry which Gentilli ascribed to Francesco Celeste Rossetti. Most of the other Rossetti men from Biasca listed in the Gentilli book were identified by christian name in the shipping lists, with their surname spelled a variety of ways. There were no Mr. F.’s or Francescos. Gold mining provides the link between Hepburn and Hokitika. Most of the Ticinese immigrants were miners and when the gold became scarcer some were doubtless attracted to the rich new field across the Tasman. A wealthy Dr. Rossetti could conceivably have popped over from time to time to ‘visit’ his countrymen. Dr. F Rossetti and FC Rossetti were one and the same person. If all records were correct then he would have had to move back and forth between Vic and NZ for many years, practise medicine only in NZ, be appointed Italian consular agent in NZ the same year his wife had a baby in Victoria, and finally settle in NZ with a second wife. But what happened to the first wife and all the children, not mentioned in his will in NZ? Why was his middle name not given in any NZ official records? It did not seem possible. Or were they two different people, born about the same year in the same village of Biasca. One a MD and one a storekeeper- restaurateur. From various websites I discovered that the Ticini area of Switzerland was a wild mountainous place and whole villages could consist of only one or two surnames. Six Rossetti males had all emigrated from Biasca alone in one year – and not all of them were listed in Gentilli. That was not a concern – it was known that many did not stay more than a short time before returning home, or moving elsewhere. The same pattern occurred in America. But then where was FC Rossetti’s death and what happened to his wife Honora? The arrival of Catherine Rossetti’s death certificate put an end to these speculations. What a wealth of information is contained in a NZ certificate! She was born Catherine O’Grady, in Newbridge County Kildare, sister to Bridget O’Grady the mother of Kate and Bridget Behan. Catherine married an F. Rossetti in Geelong, Victoria when she was 31, ie in about 1853– the same year Dr. Francesco Rossetti is believed to have arrived in Australia. By the year of her death, Catherine had been in New Zealand 23 years, which agrees with the year Dr. Rossetti is known to have arrived in Hokitika – 1866. There was no living issue. So – there were definitely TWO Francesco Rossettis. One a MD and the other most likely without medical qualifications. It is confidently expected that any further information such as that contained in NZ and Victorian electoral rolls will support this conclusion. Yes, Robert Wentworth Wade the Mayor of Hokitika in New Zealand married an Irishwoman – but the pathway to discovering who she was and where she came from was not as straightforward as expected. 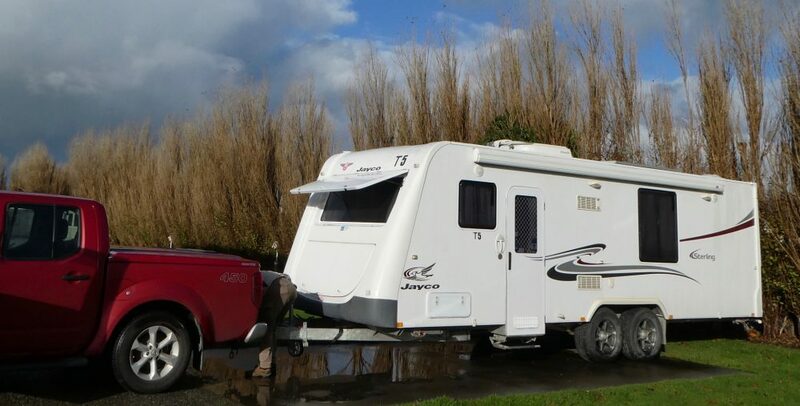 It led me through a remote alpine village in Switzerland and the goldfields of Victoria, with many interesting discoveries along the way. Postscript: Since publication of this article in the magazine of the NZ Society of Genealogists, I made contact with a descendant of Kate’s sister and now have much more information about her family, and even a precious photo showing Catherine (Kate) with her sisters. (C) Nancy Vada Gibb. Published in The Genealogist, magazine of the NZ Society of Genealogists.